Does safety make a difference in selecting the right TNF antagonist? Tumor necrosis factor (TNF) antagonists are biologic response modifiers that have significantly improved the outcomes in patients with rheumatoid arthritis (RA). At this report, safety data were collected on approximately 271,000 patients administered infliximab (as of February 2002), 121,000 patients administered etanercept (as of December 2001), and on 2400 patients who received adalimumab in trials in connection with the regulatory approval process (approval granted December 2002 in the US and September 2003 in European Union). Infliximab and etanercept have predictable and manageable safety profiles, and preliminary data suggest that the profile of adalimumab is comparable. Safety issues involving the anti-TNF agents as a class include the risk of injection-site reactions or infusion-related reactions, infection (for example, serious, opportunistic, or tubercular), malignancy, autoimmunity, and demyelinating and neurologic disorders. Injection-site and infusion-related reactions are most often easily managed and rarely lead to discontinuation of therapy. Infections can be minimized or prevented by screening and careful monitoring and follow-up; most infections respond to appropriate medical treatment. More studies are needed to evaluate the occurrence of malignancies in patients with RA to determine the potential risk posed by therapy. Antibody formation can follow the administration of any biologic agent. Although demyelinating disease has been reported with anti-TNF agents, it is not clear whether a causal relationship exists. Overall, the anti-TNF agents are well tolerated and have demonstrated a favorable benefit-to-risk profile in patients with RA. Although no direct comparisons of these agents have been made in large clinical trials, an extensive safety database has been developed. This article provides an overview of the safety of anti-TNF agents as a class and individually. Since their introduction, infliximab and etanercept have become widely used biologic agents for the treatment of patients with RA. Together, nearly 400,000 patients have now used these agents, with approximately 271,000 patients having been administered infliximab as of February 2002 (data on file, Centocor, Inc.) and approximately 121,000 patients having received etanercept as of December 2001 (data on file, Immunex Corp). Safety data for adalimumab are limited to phase I and early phase II data, which are proprietary, and late phase II and III data, which have been presented at rheumatology congresses; since approval approximately 2400 patients have received adalimumab (data on file, Abbott Laboratories). TNF is an important proinflammatory cytokine that induces immunologic changes, including the production of other cytokines, the expression of adhesion molecules, and the release of procoagulant substances . TNF also participates in host resistance, thus raising concern that anti-TNF agents might be associated with an increased risk of infection and malignancy. Other concerns about the use of these agents in patients with RA include the risk of autoimmune disorders, demyelination, and neurologic events . The anti-TNF agents are biologic response modifiers that have been developed for parenteral administration. Infliximab is administered intravenously, and etanercept and adalimumab are administered subcutaneously [3–5]. Many of the adverse events (AEs) discussed below are related mainly to the administration of these drugs (e.g. injection-site reactions, infusion-related reactions). Because etanercept (Enbrel®, Immunex Corp) was the first anti-TNF agent introduced (November 1998), it has been studied the most extensively. Among AEs reported in 3% or more of all patients in placebo-controlled and active-controlled RA clinical trials of etanercept, the most frequently encountered have been injection-site reactions, which were reported in 37% of etanercept-treated patients versus 10% of controls in placebo-controlled trials, and 34% of etanercept-treated patients versus 7% of controls in active-controlled trials (Table 1) . These reactions are generally mild-to-moderate, occur sporadically (in an average of 4 of approximately 104 injections yearly) and do not necessitate the discontinuation of the agent [3, 8]. In controlled trials, upper respiratory tract infections (URIs) were the most common type of infection, occurring in approximately 20% of etanercept-treated patients and controls . The Safety Trial of Adalimumab in Rheumatoid Arthritis (STAR) was a 24-week study that evaluated the safety and efficacy of adalimumab (Humira™; Abbott Laboratories) in combination with standard-of-care therapy (namely disease-modifying antirheumatic drugs [DMARDs], corti-costeroids, and non-steroidal anti-inflammatory drugs [NSAIDs]) in 636 patients with active RA . The safety results of this trial showed no significant difference in the incidence of AEs between adalimumab-treated patients and controls (86.5% versus 82.7%) . AEs were categorized as non-infectious or infectious. Among the non-infectious AEs, injection-site reactions were the most commonly reported, occurring in 19.5% of adalimumab-treated patients and 11.6% of controls (P < 0.05; Table 2) (data on file, Abbott Laboratories). Infections reported as AEs included URIs, sinusitis, and the influenza syndrome. URIs were reported most frequently (19.8% of adali-mumab-treated patients versus 15.1% of controls) (data on file, Abbott Laboratories). More than one occurrence per patient is possible. Injection-site reactions were the most frequent reported non-infection adverse event. Data on file, Abbott Laboratories, Abbott Park, IL, USA. STAR, Safety Trial of Adalimumab in Rheumatoid Arthritis; SOC, standard of care. Keystone and colleagues conducted a 52-week, double-blind, randomized trial to evaluate the efficacy and safety of adalimumab in 619 patients who had active RA despite methotrexate therapy . 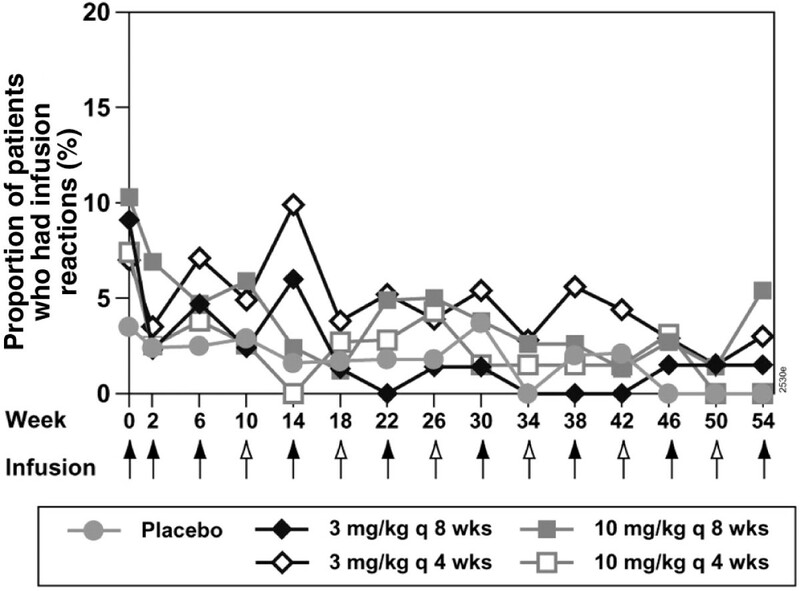 Patients were randomized to receive adalimumab subcutaneously 20 mg weekly or 40 mg every 2 weeks, or placebo. Efficacy results at 52 weeks showed a significant response in clinical measures of disease activity (for example, tender joint counts) and significant differences between adalimumab and placebo in radiographic end points (namely Sharp score, erosion score, joint-space narrowing score) . Safety results showed injection-site reactions (erythema, itching, hemorrhage, pain or swelling at the site of injection) to be the most frequently reported AE, occurring in a similar percentage of patients in the adalimumab and placebo groups (22.9% and 23.5%, respectively) . The rate of withdrawals due to AEs was 10.0% among adalimumab-treated patients compared with 6.5% among placebo-treated patients . Although infliximab has been used for a shorter time than etanercept, it has been administered to almost twice as many patients. As a result, the number of patient-years of the use of these agents can be considered comparable. Because infliximab is administered intravenously, patients can develop an infusion-related reaction rather than an injection-site reaction. Infusion-related reactions are defined as AEs occurring within 1–2 hours of infusion therapy . Clinical trial data have shown that 22% of infliximab-treated patients have experienced an infusion reaction compared with 9% of controls . Considering that a patient with RA might receive more than one infusion of infliximab over time, another way of determining how often infusion reactions have occurred in clinical trials of infliximab is to divide the number of infusions that resulted in infusion reactions by the total number of reactions. Clinical trial data from 1678 infliximab-treated patients and 731 placebo-treated subjects show that 4.8% of infliximab infusions resulted in infusion reactions (537 infusions with reactions/11,253 total infusions) compared with 2% of placebo infusions (85 infusions with reactions/4183 total infusions; data on file, Centocor, Inc.). However, fewer than 1% of infliximab-treated patients develop serious infusion-related reactions, and only 2.5% of reactions result in a discontinuation of therapy (data on file, Centocor, Inc.). Infusion-related reactions are generally mild and non-specific, can usually be prevented or easily managed, and seem not to be related to changes in dose or frequency of administration (Fig. 1) [4, 11–14]. As with etanercept and adalimumab, the most frequently reported infectious AEs in infliximab-treated patients are URIs; they have been shown to occur with a similar incidence between treated patients and controls (34% versus 33%) . Infusion reactions by dosage of infliximab as reported in the ATTRACT study. All patients received concomitant methotrexate. ATTRACT, Anti-Tumor Necrosis Factor Trial in Rheumatoid Arthritis with Concomitant Therapy [12–14]. Symptomatic injection-site reactions can be managed with warm compresses and oral antihistaminics. Acute infusion reactions generally respond to a decrease in the rate of infusion of the drug . Pretreatment with an oral H1 blocker such as diphenhydramine (25–50 mg) and acetaminophen (500–1000 mg) can be used to prevent many of the symptoms . Viral URIs are usually self-limiting, whereas bacterial URIs generally respond to oral antibiotic therapy. Factors predisposing patients to infection include the use of concomitant immunosuppressant therapy and the severity of the underlying inflammatory disease . The incidence of serious infections (namely infections requiring hospitalization or parenteral antibiotics) in patients with RA before the anti-TNF era ranged from approximately 0.02 to 0.12 per patient-year [18–21]. Clinical data have shown the incidence of serious infections in patients treated with etanercept to be 0.041 per patient-year, or approximately 1%, which is similar to the incidence reported in controls (data on file, Immunex Corp). Postmar-keting data have indicated an incidence of 0.007 serious infections per patient-year in etanercept-treated patients, although under-reporting cannot be discounted (data on file, Immunex Corp). Postmarketing studies of etanercept have also yielded reports of sepsis and death, sometimes occurring within weeks of initiation of therapy (data on file, Immunex Corp) . For this reason it is important not to institute etanercept therapy in patients with an active infection or in those with chronic infections, and to withhold therapy in patients who develop a serious infection. Tuberculosis (TB) has been reported in patients receiving anti-TNF agents; it remains the subject of safety surveillance in the use of these agents . Although no cases of TB occurred in etanercept-treated patients during clinical trials, there have been 20 confirmed cases of etaner-cept-associated TB worldwide since the drug was approved (data on file, Immunex Corp). Of those cases, 75% occurred in the USA, which has reported approximately 14.3 cases per 100,000 etanercept-treated patients; the remainder came from Europe. (To place this in perspective, the incidence of TB in the USA, as reported by the most recent data from the Centers for Disease Control and Prevention, is 6.2 cases per 100,000 population ). It is not known what the incidence of TB is in the RA population not treated with anti-TNF agents. Of the 20 cases, 85% were of localized disease. In post-marketing reports, serious infections, including TB, and sepsis have been reported with etanercept. Close monitoring is advised for patients who develop a new infection while undergoing therapy with etanercept. Treatment should not be initiated in those with active infections, including chronic or localized infections . Postmarketing data have also reported serious opportunistic infections in etanercept-treated patients (data on file, Immunex Corp). Fungal (Histoplasma, Aspergillus, Candida, Cryptococcus, Sporothrix), viral (cytomegalovirus), bacterial (Listeria), and protozoal (Pneumocystis) infections have been noted in all organ systems of patients receiving etaner-cept as monotherapy or in combination with immunosup-pressive agents . In placebo-controlled trials, the incidence of serious infections, including TB, in adalimumab-treated patients (0.04 per patient year) was similar to that in placebo-treated patients (0.02 per patient year) . The 13 cases of TB reported in clinical trials with adalimumab included several types e.g. military, lymphatic, peritoneal, and pulmonary TB . However, in phase I trials in which adalimumab was administered at 20-fold higher doses than that used in current trials (approximately 40 mg every 2 weeks), researchers noted a 2.5% incidence of TB infections in study participants (Table 3) (data on file, Abbott Laboratories). In early phase II clinical trials, the dose of adali-mumab was reduced to about four times the currently used dose, and the incidence of TB dropped to 1%. Patients had not been screened for TB in these trials before the administration of adalimumab. In phase III trials in which the dose of adalimumab was double that used in current trials and in which chest X-ray was used to screen for TB, no cases of TB were reported. These short-term safety data for adalimumab suggest that the risk of reactivation of latent TB is increased relative to controls. aNumber of times above the commonly administered dose of 40 mg every 2 weeks. Data on file, Abbott Laboratories, Abbott Park, IL, USA. No data on other opportunistic infections have yet been made available, nor have there been any reports of such infections. Postmarketing data will be needed for a full evaluation of this potential risk. Clinical data have shown the incidence of serious infections in patients treated with infliximab to be 0.030 infection per patient-year (data on file, Centocor, Inc.). Post-marketing surveillance up to December 2001 has not detected any change in this rate. Opportunistic infections caused by viral, fungal, bacterial, and protozoal pathogens have been observed with infliximab. Data from postmarketing surveillance for infliximab (used by 271,000 patients as of February 2002) and etanercept (used by 121,000 patients as of September 2001) indicate that an apparently greater number cases of certain opportunistic infections – particularly Pneumocystis infections and histoplasmosis – have been reported in infliximab-treated patients (26 and 18 cases, respectively) (data on file, Centocor, Inc.) than in etanercept-treated patients (4 and 1 cases, respectively) (data on file, Immunex Corp) . As of February 2002, postmarketing surveillance indicates 181 confirmed cases of TB worldwide in patients who have received infliximab (data on file, Centocor, Inc.). Most (70%) of the reported cases have come from Europe, with the remainder coming from the USA, where approximately 31 cases of TB have been reported per 100,000 patients treated with infliximab. At the time of diagnosis, two-thirds of the cases were non-disseminated. In most cases, TB had developed by the time of the third infusion, suggesting that the active infection might be a result of the reactivation of latent TB . Precautions can be taken to prevent or minimize serious infections that might occur while a patient is receiving anti-TNF therapy. Anti-TNF agents should not be administered to patients with clinically significant acute infections. In addition, caution should be exercised when treating patients with a chronic infection, a history of recurrent infections, or a disease, such as poorly controlled diabetes mellitus, that predisposes them to infection. If a patient develops a serious infection, TNF antagonist therapy should be discontinued until the infection has resolved. To reduce the risk of opportunistic infections, a careful risk–benefit assessment of anti-TNF therapy should be made before such therapy is administered to patients who reside in endemic areas; additionally, such patients need to be monitored carefully during treatment. TB is a preventable disease; therefore, screening with purified protein derivative or chest X-ray is extremely important. Patients with RA who receive anti-TNF therapy might be at an increased risk of malignancy. This is suggested by the following: (1) the involvement of TNF in host defense mechanisms, (2) the role of TNF as a modulator of cellular immune responses, and (3) previous reports describing a possible increased risk of certain cancers (such as lymphomas) in patients with RA [25–27]. Importantly, it is not certain whether this increase was related to the disease itself, the earlier antirheumatic therapies available, or other factors. The observed incidence of malignancy in etanercept-treated patients in clinical trials conducted so far (41 cases) is close to the expected incidence of malignancy in non-etanercept-treated patients with RA (42 cases), on the basis of findings from the National Cancer Institute Surveillance, Epidemiology, and End Results (SEER) database (data on file, Immunex Corp). Additionally, no type of cancer was noted to predominate in etanercept-treated patients. Longer-term data might be needed to clarify the risk of malignancy, especially the risk of lymphoma, for patients with RA receiving this anti-TNF therapy. The number of patients treated with adalimumab so far might be too small, and the time for pharmacosurveillance too short, to detect an association (or lack thereof) between adalimumab and the incidence of malignancies. In the STAR trial , malignancy developed in two patients treated with adalimumab but not in the controls (data on file, Abbott Laboratories). On the basis of data from completed trials of infliximab for up to 102 weeks, 18 of 1372 patients developed 19 new or recurrent malignancies of various types over 1430 patient-years of follow-up . New or recurrent malignancies included non-Hodgkin's B-cell lymphoma, breast cancer, melanoma, squamous, rectal adenocarcinoma, and basal-cell carcinoma. The observed rate of risk for developing malignancy with infliximab-treated patients (1.3%) was similar to that expected for non-infliximab-treated patients with RA from a previous study (1.5%; 95% confidence interval 0.9–2.3) [4, 28]. Although treatment with immunosuppressive agents is linked to an increase in lymphoproliferative diseases, there is no clear evidence that this is a direct consequence of therapy with a TNF antagonist. Nonetheless, lymphadenopathy in a patient treated with a TNF antagonist is an indication for follow-up and biopsy if the etiology is not known and nodal enlargement persists or increases. Antibody formation can follow the administration of biologic agents such as the TNF antagonists. Immunologic reactions that can occur with TNF blockade include the development of neutralizing and non-neutralizing antibodies and autoantibodies . In randomized clinical trials, the development of new positive antinuclear antibodies (ANA, titer ≥ 1:40) was noted in a greater percentage of patients treated with etanercept than with placebo (11% versus 5%) . On the basis of a radioimmunoassay, new positive anti-double-stranded deoxyribonucleic acid (anti-dsDNA) antibodies developed in 15% of etanercept-treated patients compared with 4% of placebo recipients . Although there were no cases suggestive of a lupus-like syndrome in clinical trials, post-marketing surveillance has identified 16 such cases (data on file, Immunex Corp). Although adalimumab is a fully human anti-TNF mono-clonal antibody, antibodies against adalimumab have been reported (data on file, Abbott Laboratories). However, no data are currently available in the public domain. The placebo-controlled, 102-week Anti-Tumor Necrosis Factor Trial in Rheumatoid Arthritis with Concomitant Therapy (ATTRACT) [12–14] showed that new positive ANA (titer ≥ 1:40) developed during the period between screening and last evaluation in a greater percentage of infliximab-treated patients than in controls (62% versus 27%) . Similarly, positive anti-dsDNA antibodies developed in a greater percentage of infliximab-treated patients than in controls (13% versus 0%) . The development of both forms of antibodies in the infliximab-treated patients was not associated with the dose or administration schedule of the agent. An analysis of the ATTRACT data [12–14] showed that 20% and 50% improvements in American College of Rheumatology (ACR) criteria (that is, ACR20 and ACR50 responses, respectively) were reported by similar percentages of patients who tested positive or negative for serum antibody against infliximab . ACR20 responses at 102 weeks were achieved by approximately 40% of patients who demonstrated antibodies against infliximab at any time during the study (n = 25 of 295, or 8.5% of the total patients in this analysis) compared with 38% of patients with no antibodies against infliximab (n = 105) and 62% of patients with inconclusive antibody status (n = 165) . ACR50 response rates at 102 weeks were 16%, 20%, and 41% for the antibody-positive, antibody-negative, and inconclusive antibody status groups, respectively . The higher clinical response rates for the patients with inconclusive antibody status were attributed to their maintaining higher residual concentrations of infliximab [29, 30]. In clinical studies with infliximab, three patients with RA were diagnosed with a possible lupus-like syndrome . There was no indication of central nervous system (CNS) or renal involvement, and improvement followed the discontinuation of therapy and appropriate medical treatment . Importantly, no lupus-like reactions have been observed in up to 3 years of long-term follow-up . Post-marketing data have identified a total of 39 cases of lupus-like syndrome, all of which improved on discontinuation of therapy (data on file, Centocor, Inc.). When interpreting the data on immunologic events, it is important to remember that antibody development can be influenced by several factors (such as immunogenic potential of the biologic agent, route of administration, and repeated dosing) and that assay methods to detect antibodies differ in their sensitivity and specificity . The epidemiology of demyelinating disorders in patients with RA has not been definitively established. However, there have been rare instances of new episodes and exacerbations of CNS-demyelinating disorders and neurologic events in patients with RA who were receiving anti-TNF therapy. Some of the demyelinating disorders have been observed with etanercept. Indeed, the label for etanercept includes a warning about the association of etanercept with rare cases of new onset or exacerbation of demyelinating disorders. Myelitis, optic neuritis, multiple sclerosis, and seizure disorders have been observed in association with etanercept therapy . In the clinical trials that have been conducted to date with adalimumab, no heightened risk for developing demyelinating disorders and neurologic events has been demonstrated. However, this needs to be validated with data from trials with longer duration of follow-up and from clinical practice. Postmarketing surveillance data for infliximab as of February 2002 indicate reports of central demyelination (n = 8), optic neuritis (n = 6), and Guillain-Barré syndrome/ chronic inflammatory demyelinating polyradiculoneuropa-thy in treated patients (n = 4) (data on file, Centocor, Inc.). Currently, there is no clear causal relationship between demyelinating or neurologic disorders and anti-TNF therapy. However, it makes good clinical sense to exercise caution in prescribing these agents to certain patients, such as those with pre-existing or recent-onset CNS-demyelinating disorders. The anti-TNF agents have been shown to achieve a marked improvement in outcomes in patients with RA; in addition, they are well tolerated. Safety concerns of rheumatologists, about the use of anti-TNF agents, include the potential for adverse events (such as injection-site reactions, infusion-related reactions, or URIs), infections (such as serious, opportunistic, or tubercular), malignancies, autoimmunity, and demyelinating and neurologic disorders. Generally, injection-site or infusion-related reactions are easily managed and rarely lead to discontinuation of therapy. Infections can be prevented and generally respond to appropriate medical treatment. Hence, the value of screening and monitoring should be emphasized. Antibody development can occur after the administration of any biologic agent but, as Porter reports, "the presence of antibodies does not necessarily mitigate against the therapeutic viability of a recombinant protein drug"  as has been demonstrated with anti-TNF agents . No causal relationship has been established between the administration of anti-TNF agents and demyelinating disorders or malignancies, although more studies are needed to validate any potentially heightened risk. Overall, the TNF biologic response modifiers have demonstrated a risk–benefit profile that strongly favors benefit. Choice of the optimal agent is based on accumulated clinical experience, convenience, patient preference, route of administration, and cost. The issue of safety as a factor in making the best choice of anti-TNF agent for patients with RA should be clarified with the availability of more data from clinical trial and practice experience, and from post-marketing surveillance reports. The sections on etanercept were written by RF, and those on infliximab by DY. The transcript of the World Class Debate for ACR 2002 has been published electronically in Joint and Bone. This article, and others published in this supplement, serve as a summary of the proceedings as well as a summary of other supportive, poignant research findings (not included in the World Class Debate ACR 2002). RF is a consultant, on the Speaker's Bureau and performed clinical studies for Centocor, Immunex, Amgen, Wyeth and Abbott. DY is, or has been, a speaker for Centocor, Boehringer-Ingelheim and Amgen, is a consultant for Centocor, Novartis and Boehringer-Ingelheim, and has received grants from Centocor, Amgen, Abbott, Medimmune, Alexion and Novartis.